Life and Letters of Phillips Brooks, vol. 1 (1900). I cannot tell you how many Sunday mornings since I left you I have seemed to stand in the midst of our crowded schoolroom again, and look about and know every face and every class just as I used to; nor how many times I have heard one of our home hymns ringing very strangely and sweetly through the different music of some far-off country. I remember especially on Christmas Eve, when I was standing in the old church at Bethlehem, close to the spot where Jesus was born, when the whole church was ringing hour after hour with the splendid hymns of praise to God, how again and again it seemed as if I could hear voices that I knew well, telling each other of the “Wonderful night” of the Saviour’s birth, as I had heard them a year before; and I assure you I was glad to shut my ears for a while and listen to the more familiar strains that came wandering to me halfway round the world. As Christmas of 1868 approached, Mr. Brooks told me that he had written a simple little carol for the Christmas Sunday-school service, and he asked me to write the tune to it. The simple music was written in great haste and under great pressure. We were to practice it on the following Sunday. Mr. Brooks came to me on Friday, and said, “Redner, have you ground out that music yet to ‘O little town of Bethlehem’?” I replied, “no,” but that he should have it by Sunday. On the Saturday night previous my brain was all confused about the tune. I thought more about my Sunday-school lesson that I did about the music. But I was roused from sleep late in the night hearing an angel-strain whispering in my ear, and seizing a piece of music paper I jotted down the treble of the tune as we now have it, and on Sunday morning before going to church I filled in the harmony. Neither Mr. Brooks nor I ever thought the carol or the music to it would live beyond that Christmas of 1868. My recollection is that Richard McCauley, who then had a bookstore on Chestnut Street west of Thirteenth Street, printed it on leaflets for sale. Rev. 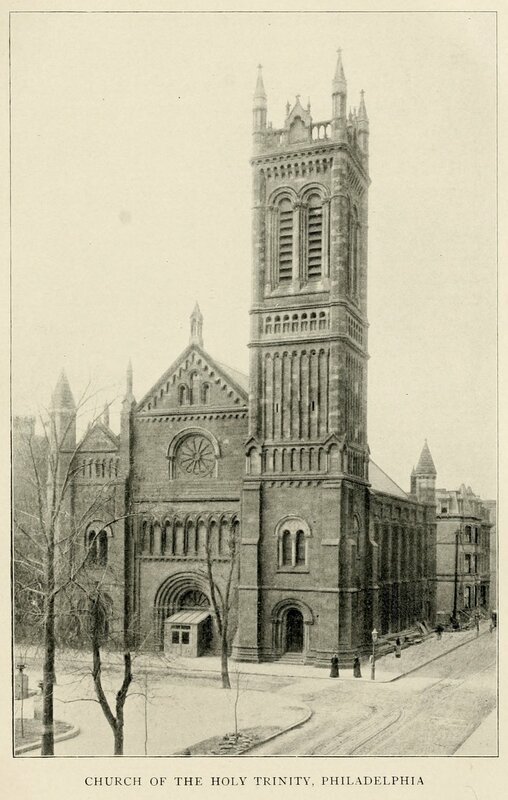 Dr. Huntington, rector of All Saints’ Church, Worcester, Mass., asked permission to print it in his Sunday-school hymn and tune book, called The Church Porch, and it was he who christened the music SAINT LOUIS. An undated manuscript of the carol is held in the archives of the Holy Trinity Church, Philadelphia. 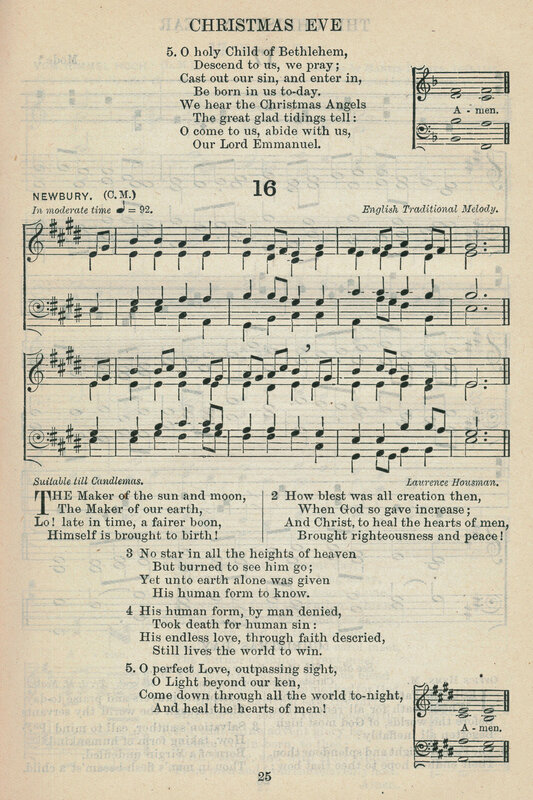 The text of the hymn was first published in The Sunday School Service and Hymn Book, arranged by the Sunday School Committee of the Diocese of Ohio (NY: E.P. Dutton & Co., 1870 | Fig. 1), in five stanzas of eight lines. Fig. 1. Sunday School Service and Hymn Book (NY: E.P. Dutton, 1870). Brooks’ text and Redner’s tune were first published together in William R. Huntington’s The Church Porch: A Service Book and Hymnal for Sunday Schools (NY: E.P. Dutton, 1874 | Fig. 2), with Lewis Redner’s tune dubbed ST. LOUIS, possibly a thinly veiled nod to the composer. In this collection, Brooks’ original fourth stanza was omitted, and this has become the usual custom. According to Redner, “The fourth line led to some amusing criticism lest it should smack of the doctrine of the Immaculate Conception. Brooks then changed that line to ‘Son of the Mother mild,’ but he afterwards decided to omit the fourth verse altogether from the carol.” This alteration was included in the posthumous Christmas Songs and Easter Carols by Phillips Brooks (NY: E.P. Dutton, 1904 | HathiTrust). Fig. 2. William R. Huntington, The Church Porch: A Service Book and Hymnal for Sunday Schools (NY: E.P. Dutton, 1874). This carol was introduced to British worshipers in W. Garrett Horder’s Treasury of Hymns (London, 1896) and The Treasury of American Sacred Song (London: Henry Frowde, 1896), pp. 197-198. Some British hymnals follow the convention established by The English Hymnal (1906) of rearranging the lines in the second stanza so it begins “O morning stars together.” The transposition works well and has a sensible flow of thought. Text: Analysis. The hymn appeals, of course, to the Nativity story, especially the passage in Luke 2 and the name “Immanuel” from Matthew 1:23. John 1:4-9 speaks of Christ as a light shining in the darkness. Job 38:7 mentions the morning stars singing together; this is usually interpreted as a metaphor for angels. The end of stanza three, “Where meek souls will receive him still,” is possibly an allusion Revelation 3:20 (“Behold, I stand at the door and knock…”). The final stanza seems to refer to the spiritual birth described in John 3. Hymnologist Carl Daw prepared a detailed analysis of the poetry for Glory to God: A Companion (2016). Among other details, he noticed the inner rhyme of the third and seventh lines of each stanza (except st. 3): “He breaks up the remaining interior eight-syllable third and seventh lines by incorporating rhyme at their midpoints, an attention to scale that bespeaks careful consideration of children’s needs in learning poetry” (p. 124). Tune 1. ST. LOUIS was composed for this text by Lewis Henry Redner (1831–1908), first printed on broadsheets by a local bookseller, then published more widely in The Church Porch (1874 | Fig. 2 above). Tune 2. The folk tune FOREST GREEN was transcribed by Ralph Vaughan Williams (1872–1958) from a Mr. Garman in the village of Forest Green, Surrey, England, in December of 1903. Williams was music editor of The English Hymnal (1906), and part of his work in involved a deep interest in collecting and preserving English folk tunes, similar to what the Irish had been doing in their Church Hymnal. The folk tune is associated with a song called “The Ploughboy’s Dream” (“I am a plough boy stout and strong”) with words traceable as early as 1795 in a broadside preserved in the Bodleian Library (Bod19089 / Harding B 7 (44) | PDF), text attributed to William Mason (1725–1777). Williams’ transcription was printed in the Journal of the Folk-Song Society, vol. 2, no. 8 (1906), pp. 203-204 (Fig. 3). Fig. 3. Journal of the Folk-Song Society, vol. 2, no. 8 (1906). This tune was adopted into The English Hymnal (Oxford: University Press, 1906), set to “O little town of Bethlehem” (Fig. 4). The editors used the full five stanzas of the hymn, with a transposition of the quatrains in stanza two, and Brooks’ alteration of stanza four to avoid the doctrine of the Immaculate Conception. Fig. 4. The English Hymnal (Oxford: University Press, 1906). Tune 3. CHRISTMAS CAROL is by Henry Walford Davies (1869–1941), first published in W. Garrett Horder’s Worship Song (London: Novello, 1905 | Fig. 5). The harmonization of the final stanza is typically adopted into hymnals. Davies’ setting has the first three stanzas melody-only with accompaniment, with the fourth labeled as a refrain in four-part harmony. Other hymnals typically borrow the refrain harmonization and use it for all the stanzas. Fig. 5. W. Garrett Horder, Worship Song with Accompanying Tunes (London: Novello, 1905). This delightful melody has nothing at all in common with mediaeval carol tunes, but it is the pure essence of its composer’s musical idiom. The rising sixth, which we have before noticed as the composer’s “signature” is there in the last line, and the cademces at the second line and at the end are unmistakably his. 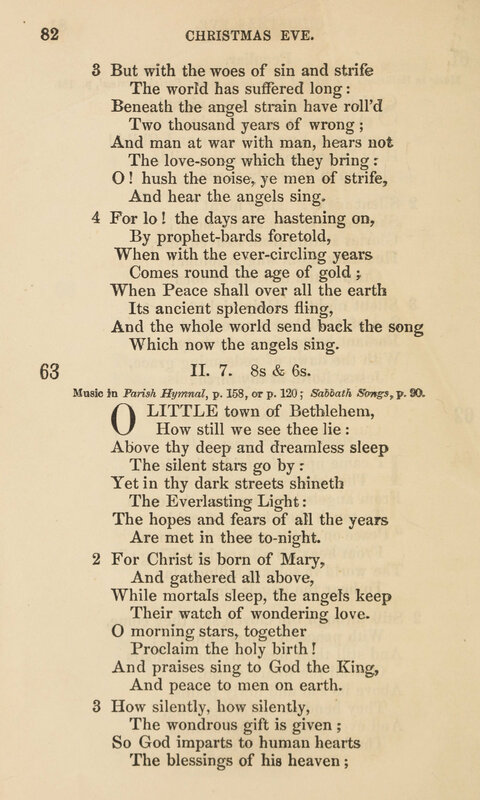 Louis F. Benson, “O little town of Bethlehem,” Studies of Familiar Hymns (Philadelphia: Westminster Press, 1903), pp. 4-6. Benson, Studies (1903), p. 12. Erik Routley, “O little town of Bethlehem,” Companion to Congregational Praise (London: Independent Press, 1953), p. 300. K.L. Parry & Erik Routley, “O little town of Bethlehem,” Companion to Congregational Praise (London: Independent Press, 1953), pp. 299-300. J. Ithel Jones, et al., “O little town of Bethlehem,” The Baptist Hymn Book Companion, rev. ed. (London: Psalms and Hymns Trust, 1967), pp. 130-131. Frank Colquhoun, “O little town of Bethlehem,” Hymns that Live (Downers Grove, IL: Intervarsity, 1980), pp. 54-60. Carol A. Doran & Alan Luff, “O little town of Bethlehem,” Hymnal 1982 Companion, vol. 3A (NY: Church Hymnal Corp., 1994), nos. 78-79. Edward Darling & Donald Davison, “O little town of Bethlehem,” Companion to Church Hymnal (Dublin: Columba Press, 2005), pp. 265-267. Carl P. Daw Jr., Glory to God: A Companion (Louisville: Westminster John Knox, 2016), “O little town of Bethlehem,” pp. 124-125; “FOREST GREEN,” p. 677.